Pairing Chocolate Truffles with Chocolate Milk Stout. I'm not an expert on matching beer and food. I just do it intuitively. If it works for us I'm happy. In the late afternoon today, when the heat of the sun was finally lessening, I had a bit of fun in the kitchen making a late afternoon treat. I created some truffles to use up the last of a very rich and rather dense chocolate and coconut cream mousse which had been flavoured with orange rind and a splash of drambuie liqeur. I formed them mixture into balls and coated them by rolling them in more coconut to make some rather decadent and moorish chocolate truffles. What a treat some freshly caught snapper caught by Rachel and Rod was for dinner this evening! We ate it simply fried with some black bean and corn salsa and a green salad alongside. A glass or two of Mike's Traditional Pale Ale went down nicely with this meal. I managed to sneak a couple of tablespoons of it before it was poured to add to this salsa which, judging by its reception, is about to become a family favourite. I flavoured these carrots with a deep-roasted sesame dressing which I discovered in the international section of the supermarket . This added both sweet and savoury flavours and helped to caramelise them. But the sesame flavour was not as intense as I had hoped. A generous sprinkling of freshly roasted sesame seeds made all the difference. The little platter they are displayed on is one that I am particularly fond of as it was made by Tony Simpson, one of the members of the pottery co-operative (Pots of Ponsonby) I used to belong to. This was an era when potters like us were influenced by the Hamada -Bernard Leach tradition of humble but beautiful domestic ware with earthy glazes which complement Japanese food so well. The final touch, that generous sprinkling of freshly roasted sesame seeds. These carrots can be served either straight out of the oven or at room temperature. In this hot weather a chilled rather than hot noodle dish is so refreshing. We like it simply flavoured with ponzu (a citrussy soy sauce) and ginger. To make I added 200 grams of dried organic soba noodles to a large pot of boiling water, stirring them with a wooden spoon as I did so to help separate out the strands, and boiled them for about 3 minutes until they were fork tender . As soon as they had reached this stage they were laid in a sieve, rinsed with cold water until they had cooled right down, then drained and put in a serving bowl. To complete the dish I finely chopped a couple of spring onions . They were tossed into the cold noodles along with some peeled and finely grated ginger. For those who like a bit of heat a few red chili flakes could have been added. This will be our Christmas salad this year. I love that it is a vibrant green and is composed of just three vegetables: asparagus, snow peas and edamame beans. It came about because we had good friends over to dinner and when I served them a medley of these three vegetables, warm and unadorned, the idea of adding a dressing came up. Not really necessary I said but then I got thinking and created this simple dressing which I do think not only enhances the flavour but means the vegetables can also be served as a salad at room temperature. To make it I boiled some young asparagus spears very briefly until just tender and blanched some snow peas. I brought some frozen edamame beans to the boil and simmered them for about2 minutes. I could have drained and refreshed all the vegetables under cold water to retain their green colour better but I just drained them and they still retained their colour well. This salad can be prepared well before dinner , Just before serving I poured over a little more ponzu lemon soy sauce and scattered the salad with freshly roasted sesame seeds. It tasted light and mellow. I could have gingered it up with some grated ginger, spiced it with some a drop of hot chilli sauce or sharpened it with some rice vinegar, but we rather liked it like this. A bag of baby kale from an organic producer at Sunday's market was the starting point for this healthy salad in which I used two Japanese ingredients: ponzu (a lemon soy sauce) and nori (roasted seaweed. Ponzu is lighter and fresher tasting than a regular soy sauce. It is seasoned with yuzu (a fruit similar to lemon) but also sweeter as it includes mirin, a sweet rice wine. I really enjoyed it but John found even the baby kale too chewy although it is much softer than more mature kale . I guess its either a case of you like kale...or you don't. The Ceres roasted seaweed comes in individual 5 g snack sachets. is certified organic and gluten free and the little flakes are just the right size to sprinkle over a salad. Wash and dry a small bagful of baby kale. Tear the larger leaves into smaller pieces . Toss the kale with the dressing. It will happily stand around for a few hours so can be prepared beforehand. But if you do, sprinkle a little more Ponzu sauce over the top of it just before serving to refresh the flavour. A cocktail or a mini smoothie ? Whatever you choose to call it this was rather delicious: sweet, sour and a little bitter. You could of course make your own sorbet, but it works perfectly well with a good shop bought locally made one, so why bother? To make it I mixed equal quantities of mango sorbet and pale ale I used OMPA Mike's One More Pale Ale) about 1/4 cup of each. I whizzed this mixture briefly in a blender. And poured it into a small glass. I added a generous squeeze of fresh lime juice and a sprig of mint. Should you decide to try it do balance this to your own taste.If you want more bitterness and less sweetness add less sorbet. If you want a sharper taste, more lime. After rather a lot of experimenting, tasting and expanding waistlines this is our favourite Christmas Cake for 2015. Soaking the fruit in a mixture of Mike's Traditional Dark Mild Ale and orange juice may sound rather radical but don't be afraid to try it. It's really good. 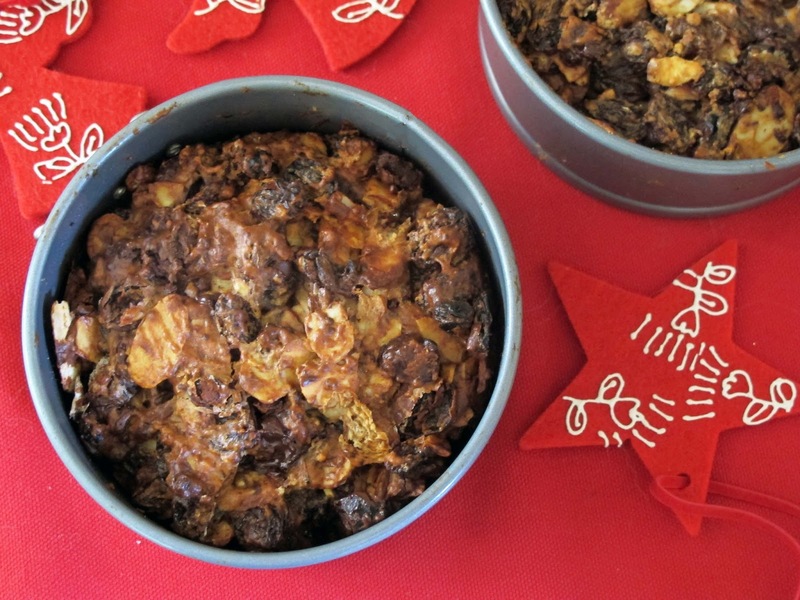 This cake is another variation on the Heavenly Fruit Cake in Everyday Easy Eats, a great collection of recipes from Friends of Balmoral School. It is so incredibly easy and unlike many Christmas cakes can be eaten straightaway. 1 cup of freshly squeezed tangelo/orange juice. 2 cups of selfraising flour. Pour the ale and tangelo/orange juice over the fruit. Either leave to fruit to soak overnight or if in a hurry heat in the microwave for 3 minutes. Leave until completely cold. Beat the eggs lightly and stir in. Whizz the chocolate and macademia nuts briefly in the food processor until roughly chopped/ or do this by hand. Add all the other ingredients and mix briefly. Line a 23cm cake tin with baking paper. Bake for 30 minutes. Cover with baking paper and bake for another 15 minutes. Test to see if done. (Ovens vary and I thought it could still do with a little longer. So I kept my cake covered with baking paper, turned the oven down to 150 degrees C and baked for a further 15 minutes. Leave to cool before eating. In this hot weather store in the fridge so the chocolate doesn't melt. It also freezes well. In fact if taken straight from the freezer you can slice it more easily with a sharp knife. I made it again the day before Christmas and had run out of Ale, but I replaced it with half a cup of Mike's Chocolate Milk Stout and 1/2 cup of water which was equally good. This is the time of year when it's nice to give a small edible gift to friends or oldies who live on their own, or to take as an after dinner prezzie . These tiny chocolate, raisin and almond cakes are just perfect for this. The raisins are soaked in Mike's Milk Chocolate Stout which gives them their special flavour. The recipe is a variation on the 'Heavenly Fruit Cake' by Prue McLafferty in Everyday Easy Eats, a collection of loved recipes from Friends of Balmoral School. I have used two tiny cake tins. The cakes are very dense so best sliced thinly with a sharp knife. A little goes a long way. A nice after dinner treat. Pour the stout over the raisins. Either leave to soak overnight or if in a hurry heat in the microwave for 3 minutes. Let cool before stirring in the beaten egg. Add all the other ingredients and stir briefly to mix. Line the bottom of 2 little 10cm cake tins with baking paper. Bake for 25-30 minutes . For a festive treat I created this alcoholic smoothie with Mike's Chocolate Milk Stout, lemonade and frozen strawberry and rhubarb compote. A little bit naughty but nice. Garnish with a sprig of mint and serve immediately. And here's the recipe for the compote which we had chilled for Sunday breakfast. I adapted it from 'Everyday Dish". There was some left over so I suddenly had the idea of blending and freezing the leftovers for a smoothie. 2 tablespoons of balsamic vinegar. Mix and put in a large ceramic dish or in a baking dish lined with baking paper. Arrange the very finely sliced orange decoratively on top. Roast until soft for about 20 minutes until the fruit is soft but not falling apart. Leave to cool. Delicious served with yoghurt and muesli. Or if you want to use this compote for smoothies remove the orange slices as the skins can be bitter. Then blend the compote and freeze. Use in the Christmas smoothie recipe. I created this dip for you Mike . It uses some of your dark pale ale. The beer nicely adds to the flavour but doesn't overpower it. So easy to make and if you serve it with carrot and celery sticks it's not too decadent at all. But if you don't mind the calories have it with potato or kumara chips. I like to give it an Asian twist by serving it with some fried shallots which are lovely and crispy and some hot and spicy Japanese Nanami Togarashi (assorted chili peppers). If you can't find them at your supermarket head for your nearest Asian Food Store. 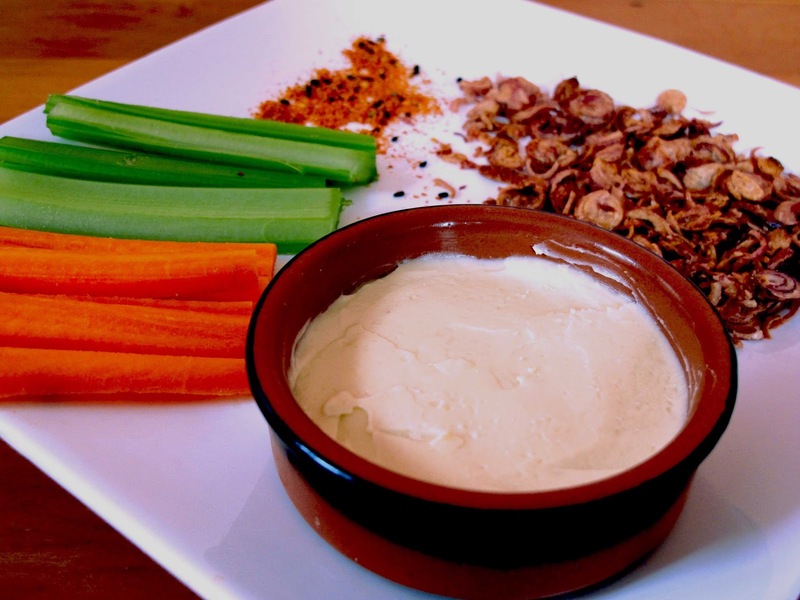 Just dip your celery or carrot sticks into the cheesy dip, then into the fried shallots. They'll hang on. Add a sprinkle of the chillies if you like it hot. Enjoy! Feed the beer through the tube as you whizz until smooth. ( This can take a little while, and several bursts, but don't worry it will happen. Chill for a while in the fridge before serving. It will happily sit there for several days so you can make it well beforehand. For a change you can also spread this dip thickly onto a sliced French bread , cover with ham and wafers of cucumber and you have a really easy platter of food to hand around while you are enjoying a cold beer with your mates.